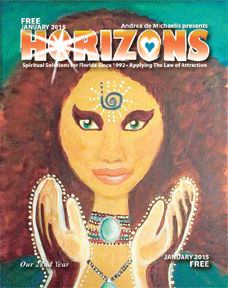 Hello and welcome to the January 2015 edition of Horizons Magazine. We’re loving the cooler weather in Florida! 50 degree nights are perfect for sitting out at the firepit. I love having woods on three sides of me. I can feel completely isolated away from civilization yet the neighborhood is right on the other side of a few lots of oaks and pines. It becomes enchanted here at nightfall, so I enjoy the outdoors when the air turns cool. I began cutting the trails through the woods last month and spent time watching the woodland creatures that I share the property with. Their nightly parade up and down the trails is a never ending source of entertainment and contemplation. Being such a workaholic, it’s crucial that I have the wooded compound here to reboot myself in. All I have to do after a long day is take a walk around the property, check out the new growth on all the plants, maybe pick up tree branch deadfall as kindling for the nightly fire, see what creatures have been walking the trails. I live in a magical, enchanted wonderland for sure, and I love that I know it. Too often, as William Blake said, “Paradise does not make itself known to us until we’ve been kicked out of it.” Thank you, Universe, for the eyes to see what I have right in front of me while I have it. I have a habit of feeling guilty when I choose to spend time alone rather than with a friend. It’s not just that I have a lot of things around here waiting to be done, it’s also that I enjoy my own company and look forward to time alone to garden, to paint, to do home projects and repairs. I like doing things alone because only when my attention is focused within can I access the inner voice of my internal guidance system. If someone or some sound is present, my attention goes to them rather than within. In the silence is when I get to spend quality time, pleasurable time, with Spirit and inner guidance. And it’s not just an empty mind space, although there are times it is that as well. I found that once you tap into inner guidance, if you’ve got an inquisitive nature you can enter into constant conversation with the voice in the head, asking questions, discussing answers, working out issues past and present. Like Googling every query, seeing the answer, asking the deeper question, seeing the answer, asking the even deeper question. That’s often what is going on within me when you see me watering the garden or mowing the lawn, painting or cleaning out my garage. Learn to get in touch with the silence within yourself and come to understand the deeper meaning of everything around you, everything you only half see and think of as mundane, ordinary and frankly rather boring. When we get bored, we’re merely missing the deeper message. I used to pride myself on all the things I got easily bored with, thinking well, I’ve been there, done that, let’s quickly get on with the next round of stimuli. Then as I began to truly awaken, I realized that although I’d had many experiences, I’d not yet begun to drink deeply of Life. I’d gotten bored with things because I’d only skimmed their surface and, in my self-absorption, I’d not reflected deeply on anything. There was a whole world waiting for me to discover it, as soon as I got over myself. That, too has become a lifelong process. Speaking of deeper meanings, a couple of weeks ago, my WordPress blog got hacked. It was time for a reboot there anyway. It happens. I contacted my server to restore it and was told the backup file was also hacked. I had no backup of my own. As it turns out, I didn’t need one. I had my magic wizard of a brother to the rescue! I wasn’t worried about losing the info because I had the entire blog in a Word file. I could pay someone to re-enter the data if I had to. I’d lose my place in the search engines for awhile, but that was ok, too. I don’t depend on my website for income. I did have complex cross-linking of my meditation and creative visualization posts, so I’d have to relink them all, which would take some time. But I didn’t feel like I’d need to. I didn’t feel like the entries were gone. I just figured it was some little glitch that would be fixed soon enough and all would be fine. I like living in the mystery. In the mystery is where the magic happens. Some computer techie friends told me the site was gone. But Brothermine seemed to think he could get the pages back on and that was enough for me. For years a mechanical engineer for Honeywell Aerospace, Jerry is really good at sussing out problems and fixing them. He warned me he might not be successful, that he’d have to re-familiarize himself with the software. History tells me he’s good at that and that he under-states his skills and knowledge. I asked a few times how it was going and he told me all the techie things he was doing. It was complex and over my head, but I wasn’t concerned. I felt he had it under control. Other techie friends said don’t count on it. I understood their concern based on their own past experience. But my past experience is that things always work out for me. My past experience is that my brother has always been able to magically fix anything I goof up on the websites. My experience is that I don’t need to know the details of how something is going to work out. I just need to have faith that it will. And it somehow always miraculously does. He had the blog online in a couple of weeks. A few years ago, that would have freaked me out. Change used to freak me out. I’d choose to stay stuck somewhere familiar rather than change anything. Then I realized that any time change had been forced upon me, it was always for the better. It always ended up being an upgrade. Sometimes we’re pleasantly surprised. My friend Domino lamented there’s no passion in her relationship. She loves her husband of five years, but they don’t share the same interests and seem to be roommates more than anything. They don’t fight and, while they do laugh together, each does their own thing, has their own job and keeps to themselves after work, he in his workshop and she in the den. Neither is particularly interested in what the other is involved with. There is no physical or emotional intimacy, they don’t even share meals. She doesn’t want a divorce and she doesn’t want to date or seek a new man, but she misses having an intense interest in — anything. Oh, she has her hobbies, she crafts and paints, but she hasn’t even felt like creating art the past year. She feels if he showed an interest in her work, she’d be more encouraged and feel he was a part of it. But she shows little interest in his work and when she does, he’s not into discussing it. She doesn’t feel she has any friends. She’s not a computer person, so she doesn’t do Facebook or belong to any forums that might help her feel supported. They already live separate lives, interacting only occasionally. I see no need for her to leave the home unless the fact of living with him brings her down. She can choose to look at it in another way. He does pay most of the bills and they are comfortable with each other. But staying where you don’t want to be does a disservice to everyone. Be where you are happy. If that means displacing a partner, so be it. Have the talk as soon as possible and free them up to find someone they deserve to be happy with. One problem in a relationship is when one person wants it to be defined and the other doesn’t want to fit into a job description. I completely understand that. I’m not one for commitment because I know intentions change. Relationships, having to answer to anyone, used to be an effort to me. My intention now is to be happy in every moment, so I’ve learned to make decisions with that goal in mind. My mind is subject to change upon evolution of consciousness. This doesn’t mean I don’t figure my partner into any equation, it means I keep him posted if and when intentions change. That way, even if we’re not on the same page, we each know what is in the other’s mind. I’m lucky in that my partner and I share many interests, while each doing what we want to do. Our lives mesh well, without compromise or sacrifice. Not everyone is that lucky. It’s clear that what Domino needs to do is discover and choose a pleasing and compelling point of focus. When she does that, all else will fall into place. She’ll be focused on exactly what she wants to do, without having to figure anyone else into the equation. If her husband, or anyone, wants to be involved in what she’s doing, she can make new decisions at any time. She can choose to seek what it is that creates that feeling of passion within her. She can choose to make it a new goal, a quest if you will, a mission to find what pleases her and what stirs her heart to passion. Don’t know where you’ll be happy? Find it, seek it, discover and choose a pleasing and compelling point of focus. Find your path and you will bring meaning to your life. In fact, even following the “wrong” path will bring meaning to your life. And it’s a meaningful life, it just takes practice. This entry was posted in Uncategorized on January 1, 2015 by Andrea.